M T D D e c e m b e r 2 0 1 8 C o m m e r c i a l T i r e D e a l e r TM 60 W hen Alton Degenhardt suggested lower in- flation pressures of farm equipment tires would reduce soil compaction, his customers were skeptical. 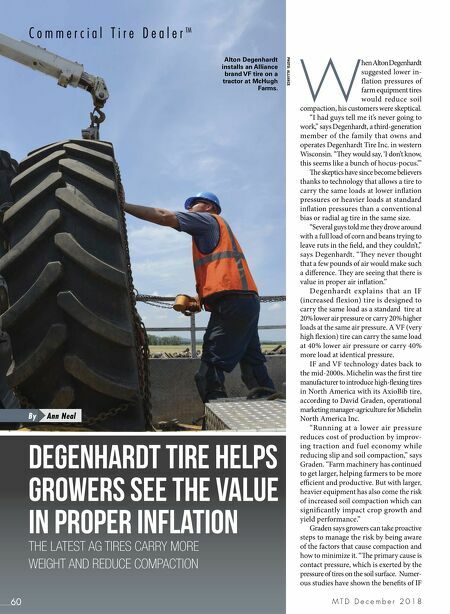 "I had guys tell me it's never going to work," says Degenhardt, a third-generation member of the family that owns and operates Degenhardt Tire Inc. in western Wisconsin. "ey would say, 'I don't know, this seems like a bunch of hocus-pocus.'" e skeptics have since become believers thanks to technology that allows a tire to carry the same loads at lower inflation pressures or heavier loads at standard inflation pressures than a conventional bias or radial ag tire in the same size. "Several guys told me they drove around with a full load of corn and beans trying to leave ruts in the field, and they couldn't," says Degenhardt. "ey never thought that a few pounds of air would make such a difference. ey are seeing that there is value in proper air inflation." 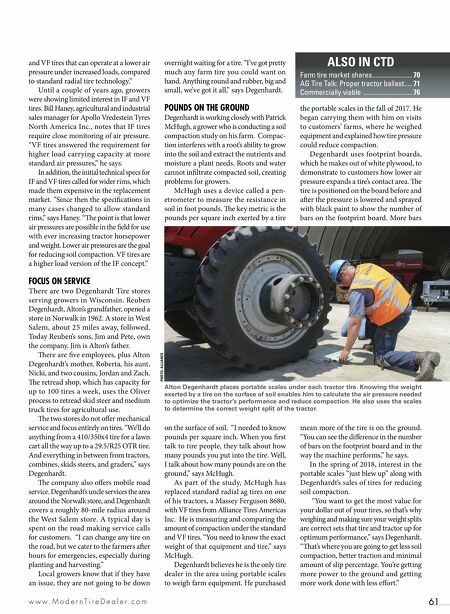 D egenhardt explains t hat an IF (increased flexion) tire is designed to carry the same load as a standard tire at 20% lower air pressure or carry 20% higher loads at the same air pressure. A VF (very high flexion) tire can carry the same load at 40% lower air pressure or carry 40% more load at identical pressure. IF and VF technology dates back to the mid-2000s. Michelin was the first tire manufacturer to introduce high-flexing tires in North America with its AxioBib tire, according to David Graden, operational marketing manager-agriculture for Michelin North America Inc. "Running at a lower air pressure reduces cost of production by improv- ing traction and fuel economy while reducing slip and soil compaction," says Graden. "Farm machinery has continued to get larger, helping farmers to be more efficient and productive. But with larger, heavier equipment has also come the risk of increased soil compaction which can significantly impact crop growth and yield performance." Graden says growers can take proactive steps to manage the risk by being aware of the factors that cause compaction and how to minimize it. "e primary cause is contact pressure, which is exerted by the pressure of tires on the soil surface. Numer- ous studies have shown the benefits of IF Degenhardt Tire helps growers see the value in proper inflation THE LATEST AG TIRES CARRY MORE WEIGHT AND REDUCE COMPACTION Ann Neal By PHOTO: ALLIANCE Alton Degenhardt installs an Alliance brand VF tire on a tractor at McHugh Farms.